In order to playback and save your favorite movies for watching on TVs at anywhere anytime, Plex Media Server could be the best solution. It allows you to store all your movies on a central server and watch them on your TV, iPad, computer or phones both home and away. To play any videos on media devices via Plex, let’s here know more about the Plex supported video and audio formats. Part 1. What is Plex Media Server? 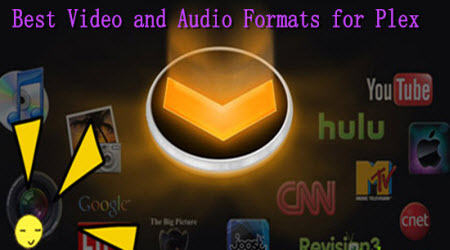 Plex is a centralized home media playback system with a powerful central server – the Plex Media Server–that streams its media to many Plex player Apps. The Server is available on many platforms like Windows, OS X, and many flavors of Linux, as well as many NAS devices like ReadyNAS or Synology. You use an App to view your media library and watch shows. Apps are available for PCs, mobile devices like smartphones and tablets, and many Smart TVs. Direct Play, Direct Stream, and Transcoding are designed to provide the perfect media to your device, regardless of what it is. So in this case, we should know better about the suitable videos and audios for Plex Media Server. If an App tells the Server that it is capable of handling the video and audio streams in the source file, but it can’t handle the file container such like MP4, MKV, AVI, etc. So for some common videos like H.264 codec MP4, MOV, etc, we can stream them well into Plex. The Server will copy the streams into a new compatible container and send that to the App so there’s a little more work required by the Server but not a lot. A Plex App understands the device it’s working on. It knows the ideal media resolution, whether it can handle a particular audio format (Dolby Digital, DTS, etc.). In other words, it can support the AAC, AC3 common audio formats well. Part 3. How to sync those incompatible video and audio formats for Plex? If an App tells the Server it can’t handle the video or audio in the stream at all, the Server will convert the incompatible tracks to a compatible one and send that to the App. How to deal the incompatible videos and audios with Plex Media Server? Here Pavtube Plex Video Converter for Windows or Mac could help you a lot, with the fast conversion speed and easy operation, it can convert any videos (include H.265/HEVC) to suitable ones also with a high original quality preserved. With this professional Plex converter, we can enjoying watching any movies from iTunes to Apple devices or some HDTVs. Is that cool? 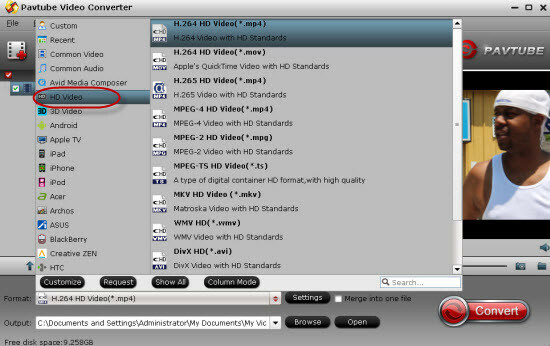 Launch this professional Plex video converter and open the main interface after installing nicely on your computer, then with the “Add video” or “Add from folder”, we can easily load our original files in. On the output list especially for Plex, we suggest you to choose the “HD Video -> H.264 HD Video (*.mp4)” as the best one. You can take the following screen shot as reference. Notes: For advanced users, you can go to the “Settings” and “Edit” interface to adjust your output videos files for more with your video and audio parameters if you like. Finally, go back to the main interface and hit the ‘Convert’ button, no needs for waiting for a long time, we can get the suitable video formats for watching HDTV or other media devices via Plex Media Server. More details on How to Store and Stream Movies with Plex for Beginners? ?